What to Do When the Gluten-Free Diet Doesn't Work? You are here: Home / Gluten-Free News / What to Do When the Gluten-Free Diet Doesn’t Work? What to Do When the Gluten-Free Diet Doesn’t Work? 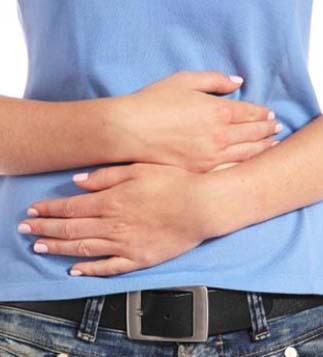 Studies indicate that up to 30% of diagnosed celiac patients may show signs, symptoms or persistent small intestinal damage after one year on a gluten-free diet. A new study proposes an approach to evaluating patients with celiac disease with persistent symptoms, persistently elevated serology, and or persistent villous atrophy despite a gluten-free diet. Read the complete article, Indications and Use of the Gluten Contamination Elimination Diet for Patients with Non-Responsive Celiac Disease published in the Multidisciplinary Digital Publishing Institute. The study also outlines the step-by-step process of going back to the basics of the gluten-free diet and how to carefully re-introduce foods so that one can determine what may be at the source of subjective symptoms or confounded healing. The gluten contamination elimination diet was designed to eliminate any possible source of gluten exposure in the diet. In this way, it can serve to delineate patients with true refractory type 1 CD from patients with non-responsive CD. Patients with non-responsive CD may be responding to minute amounts of cross contamination in an already strict GFD and therefore the first step is to remove any possibility of gluten contamination. To achieve the elimination of any possible source of gluten in the diet, almost all processed foods, even those foods labeled gluten free, are removed; only whole, fresh unprocessed foods are allowed. Few exceptions are allowed to make the diet more palatable, such as vinegar, olive oil, and plain salt. The diet must be administered under the supervision of a knowledgeable dietitian to prevent unwanted weight loss or other nutritional deficiencies. ○ Avoid “double dipping” in common condiment jars. If any source of gluten contamination is identified, the patient should alter their current practice and return for reassessment by a dietitian and physician in three to six months. Once the possibility of cross-contamination has been ruled out, if symptoms and/or abnormal serology studies persist, other conditions and the CD status of the patient should be assessed to evaluate whether symptoms may be related to active CD or another ongoing process. 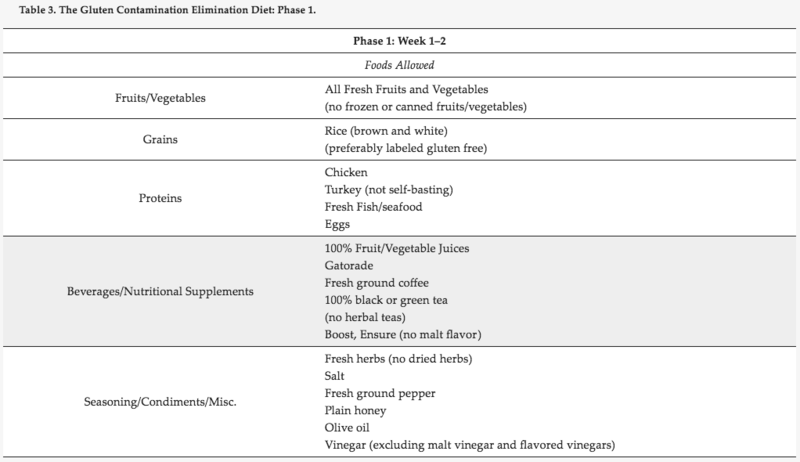 The first two weeks of the diet, Phase 1, will be the most restrictive on the gluten contamination elimination diet as the goal is to remove any gluten exposure from the diet in an effort to allow the immune system to go into remission. See Table 3 below. Foods, such as dairy items, are removed to evaluate for lactose intolerance as a culprit for some of the symptoms present. After the first two weeks, Phase 2 of the gluten contamination elimination diet allows for the reintroduction of additional foods. See Table 4 below. The gradual introduction of foods occurs over the next two to four weeks based on our experience. One new food is introduced at a time and added in every two-three days. 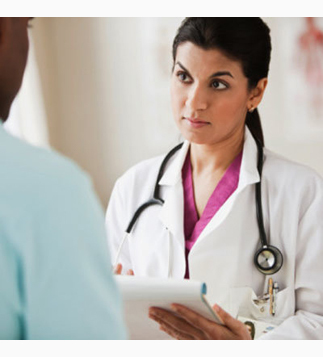 If symptoms develop or worsen, the patient should consult with their dietitian and physician. Throughout the course of the diet, patients should document symptoms so that physicians can evaluate for improvement in certain areas, such as energy, frequency and severity of diarrhea, abdominal pain and headaches. In addition to the foods listed, a gluten-free multivitamin supplement should be taken daily. Any prescription medication should also be continued, if they have been confirmed to be gluten-free. Under the guidance of a dietitian, gluten-free products such as Ensure or Boost can be added to prevent unwanted weight loss. It is recommended that the gluten contamination elimination diet be implemented for three months, and under the strict supervision of a knowledgeable dietitian. After completing the diet, the effectiveness of the diet is evaluated by repeating celiac serology and performing an esophagogastroduodenoscopy. If the previous serology was negative but histology was positive, a repeat esophagogastroduodenoscopy is the only way to determine if the diet has been successful. After completion of the diet, if symptoms persist but all measures are negative, then other conditions other than active CD must be considered. >Due to the extremely restrictive nature of the gluten contamination elimination diet, it is not recommended for use for more than three to four months. Therefore, once the healing of the intestines has been confirmed via esophagogastroduodenoscopy, processed foods should be reintroduced into the diet. The rate of reintroduction of foods will be dictated by type of symptoms the patient had prior to the start of the diet. Those with elevated antibodies or villous atrophy but no symptoms may progress faster than those who are recovering from gastrointestinal symptoms or other complaints. Processed foods should be returned to the diet slowly to monitor for any reactions or symptoms that may develop. Foods that are the least likely to be contaminated with gluten should be added first; i.e., canned and frozen plain fruits, vegetables and meats, jarred sauces, condiments and salad dressing. If these foods do not produce any symptoms, the next step would be to reintroduce gluten-free grain products. In our experience, one serving of a gluten-free grain, such as one slice of gluten-free bread or 1/2 cup pasta or cereal, may be added each day for 3 days. If no symptoms appear, a second serving may be added. After the second serving of the processed gluten-free grain has been tolerated for 3–4 days, it would then be safe to return to a typical gluten-free diet. The process of reintroduction should take about 2 weeks, depending on the individual tolerance. If symptoms occur at any time during the reintroduction, then the specific newly added item is removed until symptoms improve and reintroduced at a later date to confirm if that food was a problem. Again, the guidance of the dietitian is essential as the process should be individually tailored. If patients do not have a relapse of symptoms or villous atrophy upon return to a typical GFD they are in remission and should have routine care and follow-up with a gastroenterologist yearly. Patients who have are found to again develop signs or symptoms of active CD and/or villous atrophy on a typical GFD are evaluated and diagnosed with refractory CD and should be treated with immunosuppressant agents. 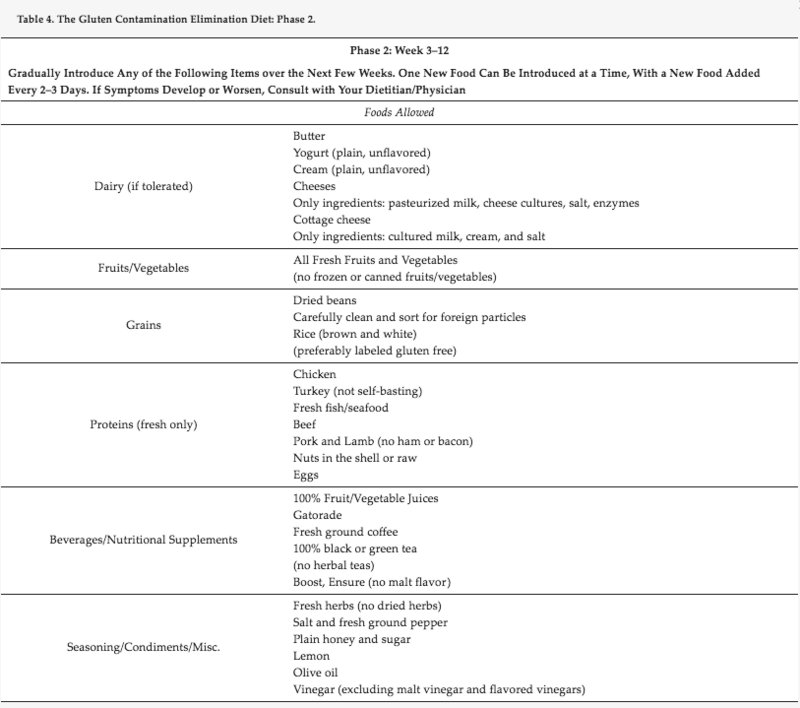 https://theceliacscene.com/wp-content/uploads/2017/11/Gluten-Contamination-Elimination-Diet-WP.jpg 357 323 Ellen Bayens /wp-content/uploads/2014/12/TheCeliacSceneLogo-575X156.jpg Ellen Bayens2017-11-20 10:36:142017-11-20 12:34:15What to Do When the Gluten-Free Diet Doesn't Work?